The big news here is that pianist Maurice Ravel arranged about twenty minutes of Daphnis et Chloé for piano, in grand virtuoso style, and they’ve never before been recorded. This is a new sibling to Stravinsky’s Three Movements from Petrushka: an iconic ballet with stellar orchestration somehow turned into a piano showpiece, with three movements each selected to form a successful narrative in concert. The highlight is the spooky shimmering chromaticism of the central nocturne, leading in through what was originally an a capella episode to the War Dance. You’ll be impressed at how well that dance turns out on piano, by the way, as one of the ultimate displays of virtuoso fireworks. The final movement is famous from the suite: it’s all the stuff between the sunrise and the orgiastic finale, including that big flute solo. Here Ravel effectively renders the piece as a string of glittering piano pearls. 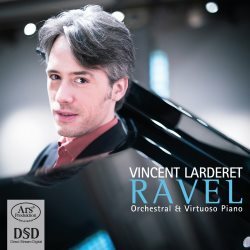 Also good news: Vincent Larderet is a pretty impressive pianist. Some of you knew this from his recital of Florent Schmitt, although I didn’t. He is certainly a fantastic interpreter of the Daphnis suite, and with a little luck and a little international fame he could be associated with Daphnis the way Maurizio Pollini is linked to Petrushka. Some parts of the War Dance sound borderline unplayable, but that just makes them all the more thrilling. His Gaspard de la Nuit is pretty good, too. It’s especially impressive in the flawlessly executed Ondine and a Le Gibet that really lays the sense of doom on thick. These dramatic readings are undermined only a little by a Scarbo that doesn’t reach their level. It’s still good, especially creepy in the central section, but a little too restrained in the ultimate example of unrestrained music. Larderet spent a lot of prep time studying the scores which had been owned and notated by pianist Vlado Perlemuter. Perlemuter spent a lot of time personally studying with Ravel and asking Ravel questions of interpretation, dutifully jotting down the answers in the margins. Larderet only consciously ignores two: he uses lots of pedal on the final chord of Jeux d’eau - though not before that; Ravel was opposed to most pedal use in this piece. He plays the Pavane, which by the time of Perlemuter’s studies Ravel was heartily sick of and didn’t want to encourage. This is a fantastic Ravel recital. It’s the best since Alessandra Ammara’s last year, although that one was deliberately eccentric and this one is not. This disc is distinguished not just by its exceptional sound quality but by the presence of that remarkable Daphnis suite, which if I were dictator of the music world would henceforth be a required part of all new “complete Ravel piano works” cycles. It’s that good, and it makes this an essential release.